Assisted by a crew of highly deft and knowledgeable personnel, we are engaged in rendering Civil Construction. These services are imparted under the command of skilled employees as per set industry standards. In addition to this, these services are attributed amid our customers for cost effectiveness. Our entity holds years of experience in rendering Industrial Civil Contractor. This service is handled by well-informed experts who use reliable printing machine and advanced techniques. Owing to their timely completion and reliability, this service is enormously well-liked in the market. Complete construction work, ready to start your life. We offer a comprehensive range Civil Contracting Services to our clients be it for commercial or residential building. Our team consists of highly qualified and experienced workers. We maintain good quality norms to meet specific needs of our clients. Further our service is equipped with latest technology and innovation at each level. Saturn Pre-fab India Pvt. Ltd. Supported by highly accomplished crew of employees, we are rendering Civil Engineering Construction Services. These provided services are delivered under the stern supervision of adroit personnel as per set industry principles. In addition to this, these provided services are attributed amid our client for reliability and cost effectiveness. magadh Power Infra Pvt. Ltd.
We undertake various types of repairing work for intake wells and rehabilitation of abandoned intake wells projects. The repair work generally is for supply, installation, repair of Pumping machinery's, intake well civil word repairs.For any type of repairing work for intake well we can submit our most competetive project reports on request. 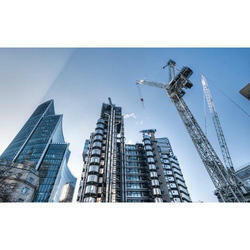 We hold expertise in undertaking Civil Construction Works with the help of professionals. Our organization is engaged in dealing with construction of different types of residential and commercial buildings as per the clients requirements. We make us of high quality construction material procured from reliable vendors. Adept in Civil & Architectural Consultancy.